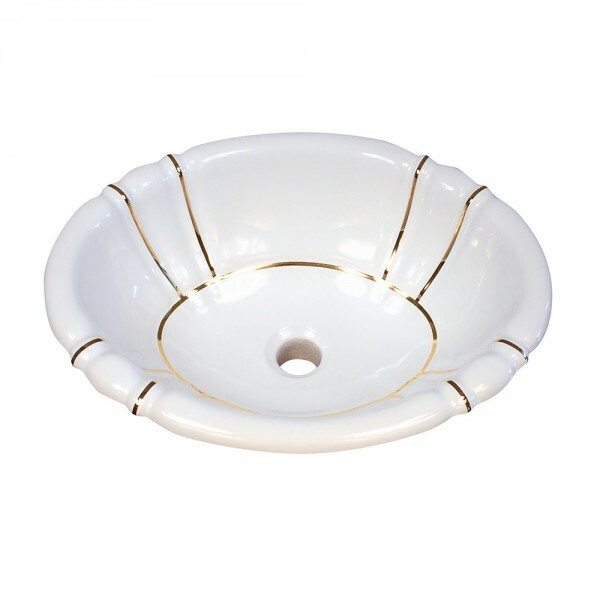 Real metallic gold bands highlight the fluting of this decorative ceramic drop-in basin. Adds an elegant touch to any, master bathroom, guest bath or powder room. Works great with virtually any vanity or countertop. Shown on a white, 17-7/8" x 14-1/2" Bates & Bates Georgia fluted drop-in, made in the USA!!! Can also be done on the Undermount Fluted, check the Fixture Choices page for more info. Ships in 2-3 weeks. Thee sink is beautiful and exactly as we wanted. The service was great and the sink arrived ahead of the scheduled delivery date.